It’s easy to identify bad role models, but how do parents go about identifying positive role models? And then, how do we convince our kids that these are the people they should be learning from and emulating? Read this month’s Heart to heart articles for three perspectives. 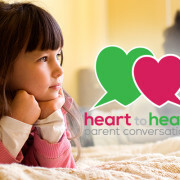 Did you know that Heart to heart offers a monthly webcast/ podcast? These short pieces provide a quick shot in the arm as you go about your parenting journey. The October 2016 topic—helping children build their self-esteem based on Christ’s love—resonated with many parents. Interested? You can find a full list of all the episodes under the “Webcasts” and “Podcasts” tabs at forwardinchrist.net. This has been what I have most appreciated about the Heart to heart series. Parents are sharing their unique experiences on how they have trained their children in the Lord. When I read Proverbs, the word train initially brings a picture in my mind of sitting down with my son or daughter and studying Scripture or reading a devotion—perhaps more of an academic experience. I’m also quite certain that modeling the application of our knowledge of Scripture is important for my kids and included in the idea of training from Proverbs. By default, parents are natural role models for their children, but we can also rely on other positive role models to reinforce that training in the Lord. I want my kids to see how God’s Word comes to life in what we do and say. I’d like them to see how others bring to life the fruits of the spirit: “love, joy, peace, forbearance, kindness, goodness, faithfulness, gentleness and self-control” (Galatians 5:22). I’d like to think my wife and I intentionally arranged our kids’ role models to be family members or called workers. However, it’s interesting that our kids picked the same people that my wife and I would consider our own role models. Maybe the secret to encouraging positive role models for our children is to be sure we have our own first. Thanks be to God that he provides faithful, Christian people in our lives who we can look to as examples. Let our kids see us cherishing them as well. Dan Nommensen and his wife, Kelly, have a teenage daughter and a preteen son. When I was a kid, I adored Olivia Newton-John’s character Sandy from the movie Grease. I wanted to be her. That perfectly flipped hair. That golden voice. That sweet, upright disposition. Then it all changed in the last scene of the movie. Gone were the sweater sets and pearls and out came the too-tight leather pants and garish makeup. She changed who she was—just to win the favor of some guy. I was crushed! How could I still look up to her? Look for role models outside the norm. Role models can come from all sorts of places: the quiet World War II veteran who lives next door and fought for his country on the beaches of Normandy. The doctor who sets aside her six-figure salary and instead chooses to volunteer in a third-world country. The teacher who has spent over half his life faithfully mentoring kids in and out of the classroom. We can help our kids find these role models. Help your kids understand that even the best role models are flawed, and we can learn from that. David—“a man after [God’s] own heart” (1 Samuel 13:14)—had an affair with another man’s wife, and when he found out she was carrying his child, he set in motion a series of tragic events that led to the death of her husband and had ramifications on David’s family for years to come. Discuss with your kids why God included flawed heroes in his story: to remind us repeatedly of our desperate need for forgiveness and the power of his grace and also to remind us that God uses us, flawed as we are, for his purposes. Helping our kids develop discernment about the people they emulate is not a one-and-done conversation. The lessons we parents teach our kids about role models is more caught than taught throughout their childhoods. Like thousands of stone chips in a mosaic, numerous mini conversations about role models create a portrait for our children of the kind of people we Christians pattern our lives after. With every two-minute reflection about Special Agent Gibbs on NCIS, a tile is placed in the mosaic. Comparing the leadership characteristics of Aaron Rodgers, Tom Brady, and Eli Manning adds another tile. Gently discussing your daughter’s musical idols lays several more. Of course, parents ensure these tiles are colored with the blood-red tones of God’s grace. Multiple mini conversations about role models remove much of the pressure parents can feel about influencing their children’s choice of heroes. It means parents don’t have to convince their children each time they tackle this topic. It encourages parents to listen to their children’s opinions. It builds confidence in children that they can make the best role model choices. T: Testify about your role models. Identify for your children why you have chosen the role models you have. Talk about how, because of them, your life is different and how your walk with Jesus has improved. This is essential: Let your children see you are striving to be the person your role model already is. A: Ask about their role models. The same questions you want to answer for your kids about your role models are questions you can ask your kids about their role model choices. Ask: Why do you look up to that person? What are the most valuable things you are learning from that person? How has this person helped you more fully appreciate God’s grace? C: Confirm their role models’ positives. Point out the most positive traits of your children’s heroes and friends. For example, “I’m glad you hang around with Ethan. He’s always polite.” This gains more ground than stumbling through what you don’t like. When you identify favorable traits, you confirm for your children that they are making good choices, and you help them define whom they want to influence their lives. Begin the conversations early. Continue them often. Build the mosaic. Use TACT. https://wels.net/wp-content/uploads/2015/02/711x400-Together-HeartToHeart.jpg 400 711 Briana Lambrecht https://wels.net/wp-content/uploads/2013/04/WELS-logo3.png Briana Lambrecht2017-02-01 01:00:382018-05-24 00:54:57Heart to heart: Parent conversations: How do parents go about identifying positive role models?